How do you most effectively translate your organisation's knowledge, experience and procedures into a process map? 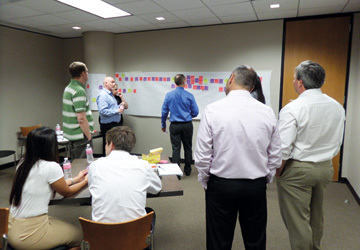 Since joining Triaster, we have both been facilitating process discovery for multiple customers in many very different environments, delivering Triaster process discovery workshops. With the benefit of this experience, we would like to share some best practice facilitation approaches with you. 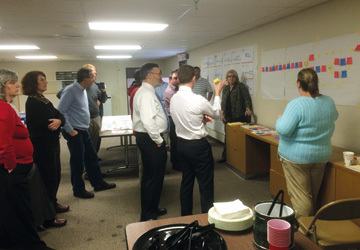 There are many ways of conducting a process discovery session however, in any event we recommend that no more than ten people are invited to attend, otherwise the session is likely to become unwieldy and unproductive. Subject matter experts from the business area you are mapping are essential and it is also preferable to have someone present who has knowledge of how the process links to other business areas. There are times when a notepad and pen are all that are needed, particularly when interviewing subject matter experts one-on-one. 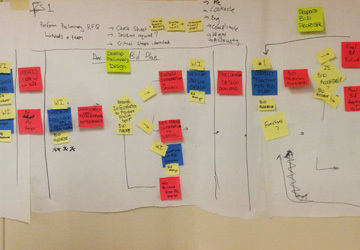 Generally though, to transform a teams' grey matter into vibrantly useful, usable and used process maps, we take a high impact, visual approach. For maximum effect, you need at least three different coloured packets of sticky notes, a roll of brown paper and some pens ('Sharpies' work well). Of course, flip chart paper instead of brown paper works, but takes more effort to stick on the wall and take down afterwards! 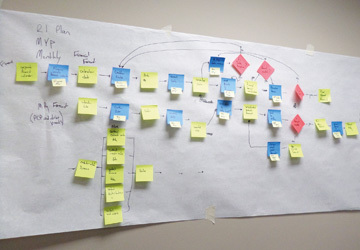 Capturing the process steps on the sticky notes enables both the initial capture and also the subsequent (and inevitable) amendments and changes to be executed quickly, efficiently and visually. However, putting sticky notes on brown paper is the easy part; the challenge comes in capturing the correct level of detail, keeping the room engaged and crucially - asking the right questions. It is vital to agree the scope of the subject to be covered prior to starting the discovery session. You should also time limit the session, in order to keep the team focused. Start the session by focusing on the start and end point of your process scope. For example, for a sales process the start point might be, 'Customer enquiry' and the end point 'Quote'. Write these on the same coloured sticky notes and stick them at the start and end points of your brown paper, as your goal posts. These goal posts will be the Deliverables, hence the need use the same coloured sticky notes for both - this colour should then be used for all other Deliverables captured. 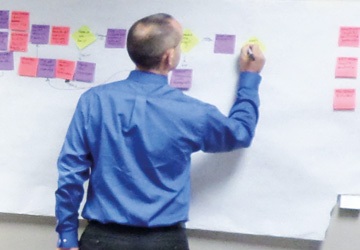 Different coloured sticky notes should also be used consistently, for Activities and Decisions captured. 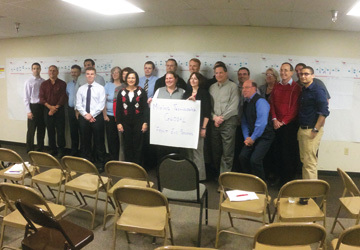 At Triaster, we focus as much as possible on the Deliverables that are produced throughout a process. We believe that Activities have no value, but rather attract a cost, whether that is in terms of budget, time, or resources. The value of a process is in the Deliverables that are produced by the Activities undertaken. 'What does that Activity produce?' or 'What do you have now that you didn't have before?' We also consistently challenge the Activities undertaken throughout a process with the question 'so what?' This seems a bit blunt to begin with, but does ensure the team focuses on what they are delivering with their activity. To ensure that the Activities and Deliverables captured make sense, we always use 'how to' /' how do I' and 'show me the' ...labelling. For every Activity, imagine the words 'how to' / 'how do I' ... as an invisible prefix; with deliverables, imagine 'show me the' ... as the invisible prefix. Remember that you are helping your teams to 'see' their processes; you can therefore begin to measure the value of what they produce. To quote the organisational theorist Dr. Myron Tibus, 'you don't learn to process map, you process map to learn'. Valuable time and resources can be saved and efficiency opportunities identified. So assemble your team, agree on the subject scope - particularly its beginning and end points - and start capturing Deliverables. For further information on how Triaster can assist you with Process Discovery and Business Improvement facilitation, please contact Customer Services by e-mail to customer.services@triaster.co.uk or call 0870 402 1234 and ask for Jo Dolton. During these workshops we both 'extract' the process and supporting data from your teams (as described above) and also create and publish the process maps to your Process Library. If you would like any more information or would like to trial the Triaster Solution we would be delighted to hear from you. Or click on the 'contact us' button below to let us know your area of interest.You can also use the contact form to just sign up for the Connector Newsletter and/or Product Release notifications.